We have area rugs and rolls of carpet in stock! new stock for the holidays, a summer cottage, or a fun replacement. 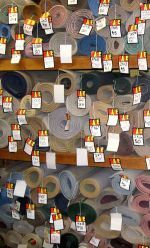 We have an entire rack of samples dedicated to carpets able to be installed immediately. Our selection takes into account the island’s humidity, sand traffic and numerous dogs. Commercial carpeting, berber, sisal, plush, astro turf, and car carpeting are all part of our selection. These carpets are all purchased by the roll so our savings is passed to you. Don’t have the exact size you are looking for? We can make it!!! We do binding on site and you can pick your own binding color! Special order Wide Binding available too.